"It was a good flat," said The Tall One. "We liked the landlord too, so I felt a bit bad telling him I couldn't physically fit into the bathroom, and, sorry, it just wasn't going to work out." He's been flat hunting for next year - already! - and I had to laugh at his bringing up the size thing - on the very day I was about to send him a link to my new favourite thing. Tiny Houses. Here it is. This is what I would like: the real thing, of course; but I'm starting small with the paper model which my handyman here lovingly put together for me yesterday while I made Sunday dinner.Because a year after scrapbooking that page, I'm still dreaming. And if you dream enough, chances are sooner or later you end up on Pinterest. Clicking. So,that would be exactly where I found it. The house of my dreams. I hadn't heard of The Tiny House Movement, that day I started randomly clicking. Now I'm completely converted. Over here we are starting to get used to the idea of extra rooms in the garden - studios, guest rooms, offices - but The Tiny House Movement (which started in the States) takes "out of the big house" living to a whole new level. Tiny wooden houses, 18' long, but with everything you need for permanent living. At least, I say permanent: they're built on wheels so that they don't need to conform to real house building codes. I'd call that an advantage, though. I could move it around, change the view. Oh, I do want one! It would make the perfect retirement project. I told The (Not So) Small One this. "It's a perfect retirement project," I said. "Your dad can build it for me, and that'll keep him busy for years, and then when it's finished, I'll go and sit in the garden in it and you can visit. It's a win win situation." But she rolled her eyes and went to do her homework. ...and that gets me dreaming again. You would all be welcome to visit. Just not all at once. Best to phone ahead first. Yes? It's a lovely idea, but I fear I am far too much of a hoarder to ever fit in a space like that! Funnily enough, when I went to Lidl yesterday, there was what looked like a horse box (one of those big fancy ones) from the side, but as I came around it had a wooden "porch" at the back painted bright yellow. 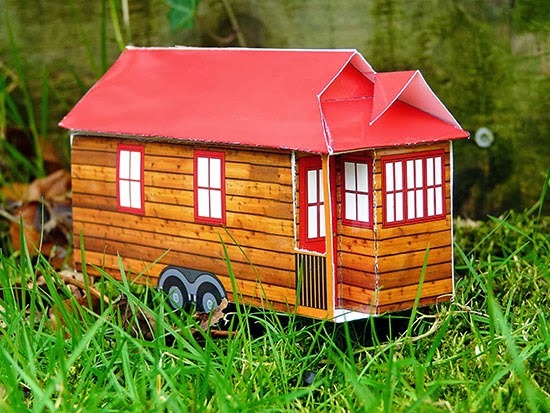 Perhaps they were part of the Tiny House Movement and on their travels! LOVE it! I really like what they are doing these days to remodel very old campers. Such cute ideas and practical too! I'll come visit! Several years ago I found a lovely book about small houses in the library and brought it home. I poured over it and was simply fascinated by the way the architects and designers had provided so much living in such a small space. I hadn't heard about the small house movement on wheels, but just checked it out on Amazon, and see there are several books I'll look for in the library. Being an aspiring minimalist, I first came across these adorable homes about two years ago. I think one would make a lovely art studio. But I could not imagine living in that small of a space. I don't need huge or grand, but I do fancy some breathing room! How sweet! I feel as smaller people they are just perfect! I can't wait to just get a house of my own really although I am loving this quirky student house. Best of luck to the Tall one. In Durham most students have signed houses for next year already! I'm afraid he wouldn't fit in ours either. I live in the attic and my housemate who is nearly 6 foot can only stand up in my room when she opens the skylight and sticks her head out! Yet another advantage of being petite is that we would fit into one of these perfectly! I think I'm too much of a hoarder to have one of these but I love the idea. Thanks for the links, I'm definitely off to find out more about this as I've never heard of it before! One of the reasons we chose our house was it's size. A 2400 sq ft or bigger house is just too much for us. Sure the 1700 we live in will be a bit cramped for the teen years but that is 5 years at most. My the time Mayhem moves out, in 8 years, we will have lived in our house for 25 years. And then there will be ALL THIS SPACE, that we forgot we had. I don't think I could downsize to a tiny house permanently but I can see living in an RV for several months every year and touring the country with it. I stumbled upon this movement last year. I read the book "You Can Buy Happiness and it's Cheap". I found it really an interesting concept. But they had no real toilet and had to shower at the gym or at work. No thanks. It is really big in Oregon. I like your idea of having it as a bit of a get away right in your yard. I do love to think of this idea of downsizing because it makes me realize how much stuff we have and continue to acquire that we don't need. Homes in North America are huge. I am so happy that the house we are in now has no formal dining room and is actually not that big on the main floor. It is a snap to clean. I do have a huge finished basement that basically sits unused but then I don't need to clean it often ;) Terrific post and I hope your dream comes true! I hope someday you are posting pics and stories from your small space. I would be claustrophobic! We will downsize in the next 10 years but I don't think we'll go down even 50%. Good luck to TTO finding a place with sufficient space. I read about this just recently ~ an American lady who'd been divorced and it was the only way she could afford a place of her own. I like the idea of it and I'm not one for hoarding piles of junk, but I think it might still be that bit small for me. Hopefully TTO will find a pad for next term soon ~ surely there are tall people in Scotland?? In fact, I know there are, my BiL is there and he is 6'4"! You aren't alone in dreaming of your own little space. I worked out today that I'll be nearing my 60's before a bedroom will become a 'spare' in our house. And even then Craig has already, ALREADY called dibs before I even finished working it out! It seems I'm doomed to have a titchy shed - not even a nice long cabin like you talk about as our garden is just to small. *Sigh* What I wouldn't give for a bit of solitude now and again. I love that idea Sian. I guess our camper is our tiny home, and on TV I saw a woman who has a small caravan parked on the drive at the front of her house. She has decorated it beautiful inside and uses it as her craft space. Clever if you have the drive space. I think the idea of children living in these is brilliant - what hope is there for younger people these days to buy their own home and renting is as much of not even more expensive as a monthly layout. Yes - hooray for the THM! Must go and check it out and I am wishing I had the land that I dream of to put one. what a wonderful idea! It really is something to think about and a serious bit of downsizing but I do love the idea especially as it is 'portable'! Yep - it's that time of year Sian. Gracia was very excited on Friday because she had been to sign the lease for her new rental house for next year. Love the idea of a tiny house of my own in the garden too! We hope to downsize too, but maybe not that small, lol! Don't know if you have Ikea, but the stores feature completely furnished very small spaces. I find them fascinating. Hope your dream comes true! - with room for scrapping, of course! Hmm, like the idea, but don't think I could pare down enough of my 'tut' to live in something so tiny! I hope you post images of how the process is comming along. I like watching and reading about the tiny house movement as I think it is an adorable idea. I think having a Tiny House as a craft space would be fabulous . . . although I'm not keen on the idea of living in one. I am married to a collector after all and paring down is not in his vocabulary! Okay, over here in the States, I've never heard of it. Although hubby is talking about downsizing for retirement - everything except for the library - which gets larger and grander every time he speaks of it. I'm off to check it out. We plan to have two tinier houses in the future . . . one on our back lot that Paul and i can retire in, and a flat in San Francisco, where we can live during the week (and come back here on weekends). I love big dreams of small places! Henry will be living in a fraternity house next year, but his friends are all flat hunting too! I keep telling Craig that I would love a little wooden house at the bottom of our garden (I even know the spot!) to use as a craft area!. I'm mindful of the gap between where I am (in a fairly large home) to a place that is about a tenth the size. What to do with a lifetime of possessions, favorites, etc.? Still the idea of such an easy clean makes it an appealing idea. I love the idea of it as a getaway out in the garden but don't think I could possibly live in one permanently.